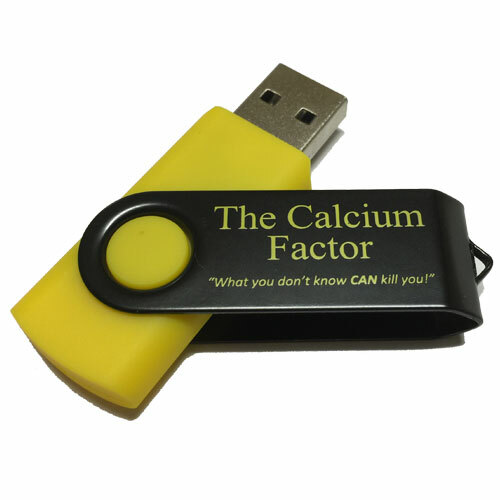 The Calcium Factor Flash Drive contains several great resources by Bob Barefoot. In the MP3 audio file "What You Don't Know Can Kill You", Bob discusses during his speech several reasons why coral calcium is essential in our daily intake, where the coral calcium comes from and all the benefits to our lives it can provide. Also on the flash drive we have included several versions of the Ebook "The Calcium Factor" for various types of e-readers, laptops, tablets and even smart phones. It's the calcium factor that Bob Barefoot wrote now in digital format! This is a great source of information on Bob Barefoot, Coral Calcium and everything you need to know to stay healthy! MP3 Audio of Bob Barefoot's Speech "What You Don't Know Can Kill You"
Works with all digital devices, may require eBook app download on smart phones to use.